The OPPO F9 Jade Green restock in limited 550 units only! 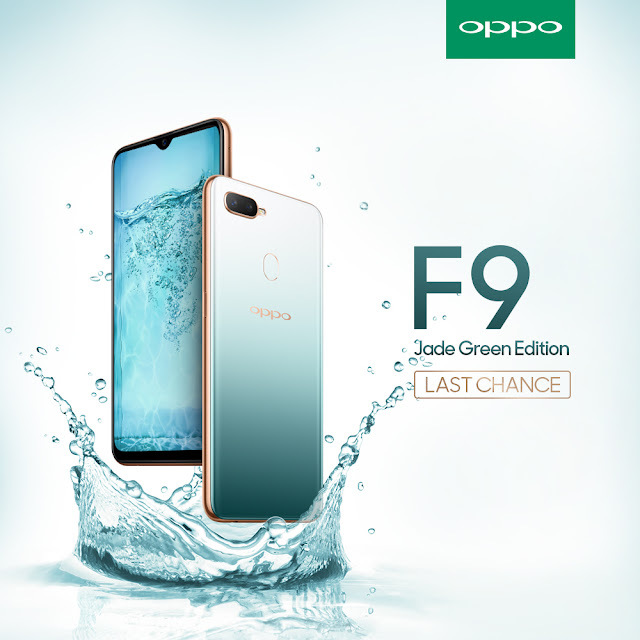 Last chance to own the OPPO F9 Jade Green Limited Edition is given on 19th January 2019! OPPO F9 Jade Green edition has received huge support from O-Fans Malaysia and the stocks have burned through in a bit over a day. While not disappointing those who yet to own the limited color option. OPPO decided to bring this color restock to online and offline platform one last time. The OPPO F9 Jade Green limited drop is coming on 19th January 2019 at OPPO Concept stores nationwide in limited 500 units; and also 50 units only on OPPO Online Store. Hence, it is the last chance for user to own this refreshing yet elegant color option. Although OPPO F9 Jade Green edition is currently out of stock, it is still available in three other color options which are Sunrise Red, Twilight Blue and Starry Purple. Priced at RM1,199, it is available in all OPPO Concept stores, OPPO Online Store, OPPO's e-commerce partners store, Lazada and Shopee; OPPO's chainstore partners, Senheng, senQ and Courts. Customers may also head to OPPO telco partners' store at Digi, Maxis and Celcom as alternatives.